We have marked one line on Discord comparison by red color. We consider this as misinformation at the best, as you have a friendlist feature within TeamSpeak3. So you may easily notice whenever your friend is online on server you connects to (and you can connect to multiple servers). 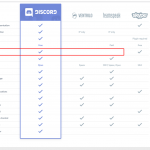 From the list of features, you may notice TeamSpeak is bit more focused on privacy than Discord. Ventrillo generally seems to not have its business in user data, but does not provide publicly its feature list and detailed information and does not encrypt communication correctly to prevent eavesdropping. Discord is very nice in its text chat features and game overlay. This is place where TeamSpeak and Ventrillo should do some work. However, Discord would need publicly available server side for on-premise installation. It would really help people with their security concerns. We also dislike misinformation and too much aggressive marketing, as we describe in chapter “Facts & myths”. Anyway, for people who simply needs to play a game and meet friend the Discord is very good option. For those who do care about privacy is TeamSpeak a better option. TeamSpeak is also better for those who are tech savvy because it has far more options you can configure than any other competitor. Ventrillo seems to be behind the competition and their authors should do a lot of work to get back close to the no. 1 of the market. From our perspective, we do care about customer data. We do really care about privacy and we prefer to have control about such things. For those reasons, we’re hosting our public TeamSpeak server for gamers community in Czech republic and generally in central europe. We’ve acquired non-commercial license as it is really just a community service, not the business for us. We’ve chosen TeamSpeak because we can host it on our hardware and have control about the server side things. Ventrillo does not meet the required security standard for us, Skype has different architecture and Discord also. With Discord and Skype, you rely on the company developing the software it will run their servers for free. 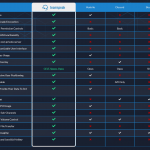 With TeamSpeak or Ventrillo, having server side installation package means you can run the service anytime on supported hardware – even if the company bankrupts. “Discord has better voice quality.” This is myth anyway. Discord utilizes the same audio codec (Opus) as other competitors do. The difference is only in configuration. So when users said discord has better voice quality than TeamSpeak, they didn’t realized TeamSpeak can be configured to the exact same quality of sound. 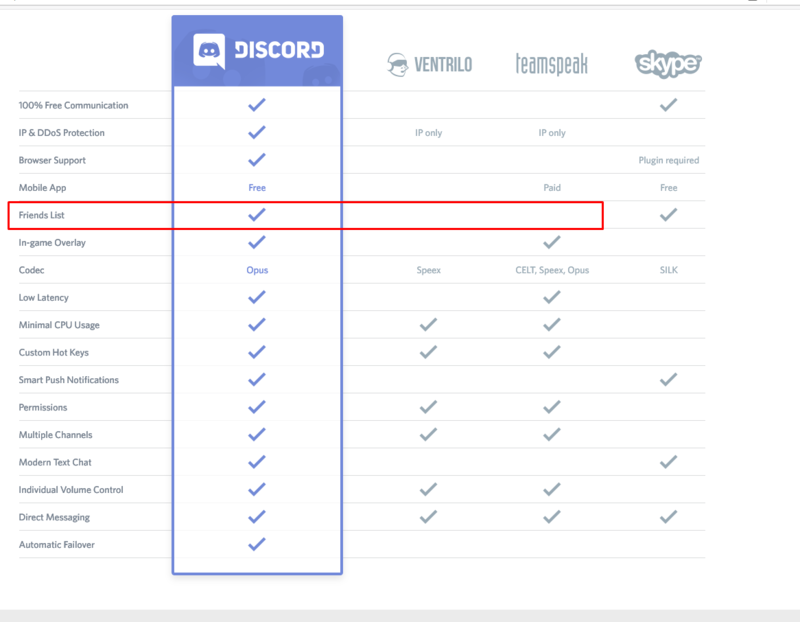 “Discord is free, whether TS and Ventrillo is not.” Even if this is partially true, we categorize this as a myth. Discord is not free. It makes its money by selling advertisement and by selling data about users they receive and by selling premium features. On the other hand, you can host your own TS server free for up to 32 people – this is quite enough for home users and small groups of gamers. So the sentence is a myth. All of these apps are getting paid, but by different ways. None of these projects are done by community, they are held by private companies, with the same intention. “Your data are not valuable, so don’t care.” Another myth. Of course your data are valuable. Otherwise how could be Discord provided completely “free”? They found the way to monetize data they received from you, users who don’t care and who’s data are not valuable. “You must have open port for connecting to private TeamSpeak server and this affects your security negatively when using TS.” Completely nonsense from technical point of view. The port must be open on router, but on server side to accept connections. Also almost all applications (Discord, VT, TS, Skype but also each multiplayer game) utilizes UPnP or other technologies to open required ports on your home router. Connecting to TeamSpeak server does not affect your network security worse than using any other network app. “With decentralized infrastructure of private servers, you must be scared what data server owner obtains about you.” First, Discord users argue that they don’t care about the information primarily. Then when they realize the reality and risks, they come with this argument. However, it just means that you are more responsible for yourselves and actions you take. We consider this as being free. With more security, you are less free. With TS you just need to know who owns the TS server and then you are quite OK. If you have a distrust in random anonymous guy, use for example our TS server – we do not hide from the public view. In case of our server, you know what information are collected and who can access it. In case of our TS server, you can read terms and conditions explaining every aspect on how service works, how it protects your data. And as we mark ourselves as an “IT security company”, we do our best to have safe and stable communication platform even for our “afterwork” hobbies. “Discord is open source.” Discord is not open source app. They have on website “Discord loves open source”. If you look deeper, it means that many open source communities utilizes Discord for communication. However, source code of Discord (both client and server side) is not publicly available. Please note, that most of myths are shared by Discord users and we found them on social media. It was not our intention to blame Discord users for misleading information, however, we did not find the same in different communities. This leads to question, why do Discord users share such misleading information and other do not? And we believe the answer is, they’re programmed to do so, by marketing of this company. At least partially. This is the first thing you’ll see when you visit Discord.gg: It’s time to ditch Skype and TeamSpeak. You can clearly see that main slogan is built on directly attacking Discord competitors. 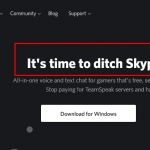 If you visit Skype homepage, TS homepage you won’t notice anything like that. Discord gathered such popularity through negativity against its competitors and its users behave in the same way. Or at least those whom for whatever reason stopped usage of other VOIP apps. We strongly believe in the freedom of choice. Each user should have multiple options to choose from. Actual market provides a lot of options and that’s quite correct because it forces whole industry to improve their products. The author of this article however subjectively dislikes the way of how some products are being promoted. We think company should be built on promoting its own qualities instead of pointing to competitors failures. Also we think that hiding facts won’t help any company and just slows down the development of whole market.